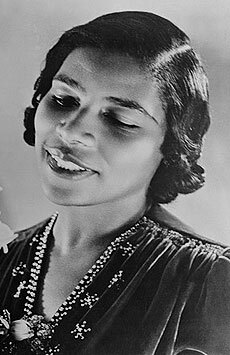 Marian Anderson is an intriguing figure in the history of 20th Century opera. She only ever performed once on an opera stage (Ulrica in Un Ballo in Maschera at the Metropolitan Opera in 1955) and yet she is one of the most important opera singers in the history of the United States and indeed the world. She was, indeed, the first black person of any nationality to perform at the Metropolitan Opera and was a key figure in the fight for black artists to overcome racism in the US throughout the century, and assisted greatly in the civil rights movement in the 1960s. As an artist, she was initially denied the stage due to the racism of her era, and despite numerous offers from opera houses outside the US, Anderson continued to perform exclusively on the concert stage in opera arias, lieder and song. Presented below is a selection from the broadcast recording of the Un Ballo in Maschera performance at the Metropolitan Opera in 1955. Conducted by Dimitri Mitropoulos, the cast included Zinka Milanov, Jan Peerce, Robert Merrill, Roberta Peters, Giorgio Tozzi and Norman Scott, and even included a young James McCracken in a minor role.